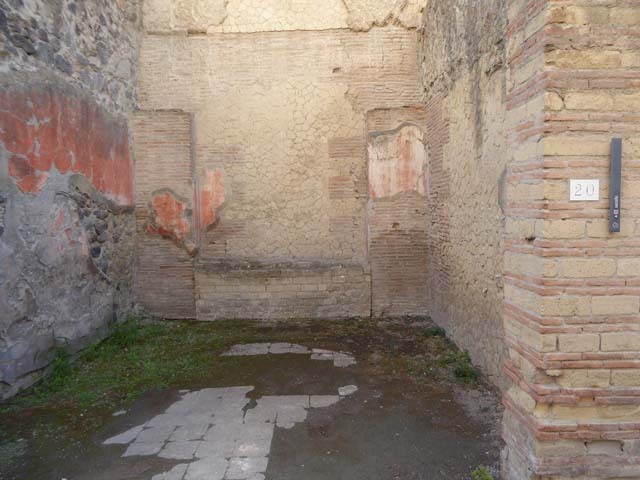 Guidobaldi wrote that this small rectangular room preserves the remains of marble flooring and a podium on the rear wall. 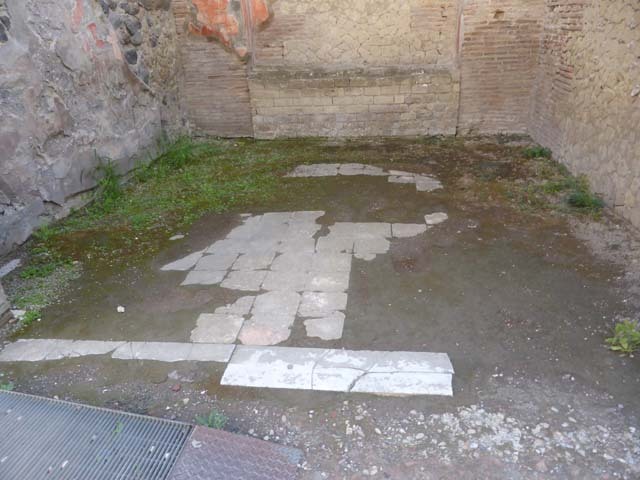 This was probably a cult room in relation to the neighbouring Seat of the Augustales. According to Wallace-Hadrill, “.. the Weights (Pondera) and the Schola should be the two spaces on either side of the entrance to the so-called College of the Augustales (or Curia).” On page186 is a photo of the exterior of the so-called College of the Augustales, (taken from the area of the crossroad on its western side), with the possible location of the weights and measures office (Pondera) in front. (this would be the area of VI.22-23). Therefore Wallace-Hadrill would seem to be thinking that this entrance, VI.20, is a Schola. See Wallace-Hadrill, A. (2011). Herculaneum, Past and Future. London, Frances Lincoln Ltd., (p.192, and p.186). He wrote that a schola is a place for gatherings, sometimes no more than an exedra, or recess within a portico. VI.20, Herculaneum, September 2015. Pilaster on west side with number plate. 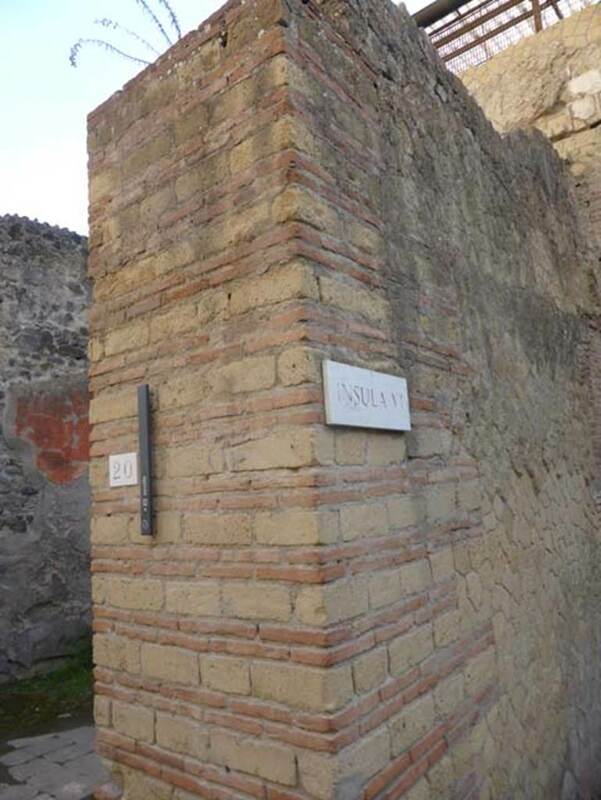 VI.20, Herculaneum, September 2015. Looking south. Photo courtesy of Michael Binns. VI.20, Herculaneum, September 2015. Looking south towards rear wall with podium. 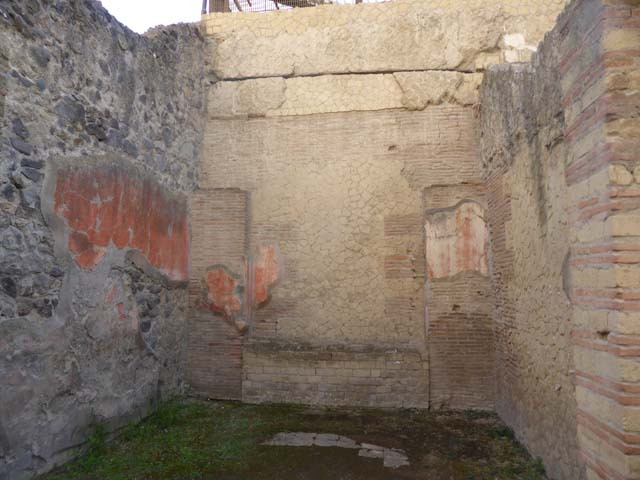 VI.20, Herculaneum, September 2015. Remains of marble flooring, looking south.